Drugs, cash, a gun and a toddler turned up during a parole search that San Luis Obispo police detectives conducted at a mobile home Thursday morning. 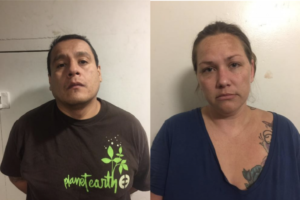 Around 9 a.m., detectives served a warrant at Angel Resendez and Amanda Bunker’s home in the Silver City Mobile Home Park at 3860 South Higuera Street. Both Resendez, 37, and Bunker, 34, were home at the time, as was Bunker’s 2-year-old son. During the search, detectives discovered about one pound of methamphetamine, a quarter pound of cocaine, one ounce of heroin, more than $9,000 and a loaded handgun. Officers arrested Resendez and Bunker for possession of narcotics for sale and child endangerment. Child Welfare Services took custody of the 2-year-old boy. Police booked Resendez in SLO County Jail on charges of possession of a controlled substance while armed with a firearm, possession of cocaine and heroin for sale, possession of methamphetamine for sale, being a felon in possession of a firearm, possession of ammunition by a person prohibited from possessing a firearm and child endangerment. Additionally, Resendez was charged with violating parole, and authorities placed a hold on him. Officers booked Bunker in jail on charges of possession of cocaine and heroin for sale, possession of methamphetamine for sale and child endangerment. Both Resendez and Bunker remain in custody with their bail set at $100,000 each. We know parole didn’t work for Resendez. How many felonies does he have to commit before he actually serves some time? A big thanks to whoever turned them in. Happiest place on earth lets build more bike lanes. Try that kid as an adult! Sadly this is every day, everywhere, USA. These two are losers, they have chosen this lifestyle, I have no sympathy for them. How much you want to bet they’re on public assistance at the same time they’re running this little side business? I feel sorry for the child.